Elf on the Shelf or Spawn of Satan? Around four years ago, a friend told me about Elf on a Shelf and I bought one with his book. My kids were 6, 4, and 2 and only the 6 year old was very interested. 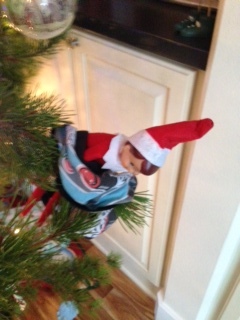 The problem was that our elf never moved. I think it moved 4 times in the whole month and he is supposed to move every night. I figured this would not be a good tradition for our family and packed the sad, little, slightly scary looking elf in a box. 6 years pass and the Elf on the Shelf becomes a huge phenomenon. My kids’ teachers have one in the classroom to keep the kids behaving. My friends’ post pictures of their elves on Instagram. I have one friend who has the boy AND the girl elf. Another friend bought CLOTHES for the elf. Their elves do massive productions at night so that their kids wake up to strings across their doors, messages in m&m’s, messes made in the kitchen, half eaten sandwiches, etc. 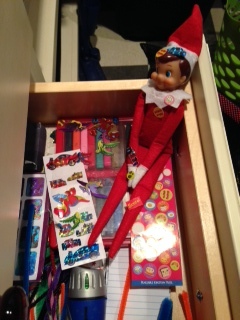 It’s been four days of that elf moving every night. The longest four days of my life. Unfortunately, I keep forgetting about this elf until about 7am when I have to wake up the kids. Sometimes I remember after the kids are up. Those twelve stairs are my saving grace. I mean the elf’s saving grace. Stupid, lazy elf with the memory of a tie tack. And I haven’t noticed my kids acting any better even though Santa now has a spy in our midst and the elf reports every night if the kids have been good or bad. I think my kids are a little too self-confident with the whole “being on the nice list.” I blame the Santa at the skating party who told my kids they are on the nice list. What kind of Santa does that the FIRST week of December? What threats does a mother have for the rest of the month if you take that one away? Luckily, my friend told me to ask them if they had it in writing. They didn’t. So they’re back to being scared out of their minds like good children should be for the month of December. I really hope this elf is a passing fancy. My mother didn’t have to deal with this pressure. She may have had to use cloth diapers but that’s nothing compared to the pressure of the Elf on the Shelf. Don’t worry. The undies are clean.